With the 2018/2019 Brut Australian Baseball League season done and dusted, now it's time to look back at how each team fared in reverse finishing order. Next up are the Adelaide Bite. Adelaide entered a rebuilding phase after collecting a then ABL-low 11 wins during the 2017/18 season. The Bite added eight wins to their tally and were only eliminated from the playoff race in the penultimate round of the regular-season after adding highly credentialed young Australian talent and impressive imports. Former Helms Award winner Aaron Whitefield made a successful switch from Brisbane and Mitch Edwards led Adelaide with 45 hits in his first season with the ballclub. 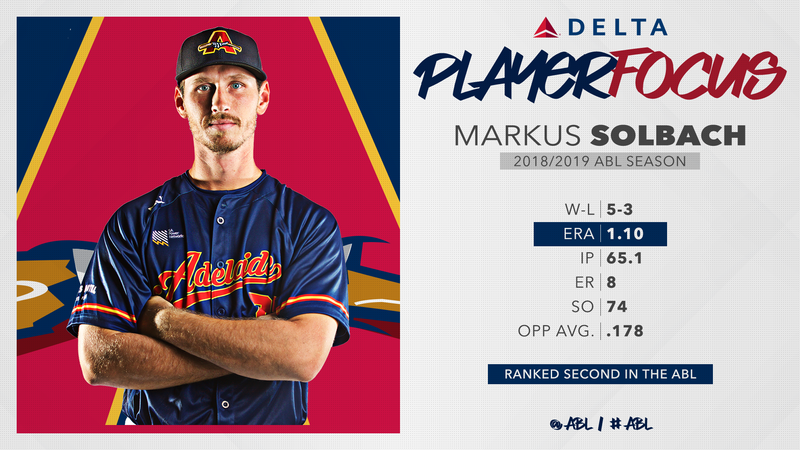 Starting pitcher Markus Solbach earned a contract with the LA Dodgers after recording a 1.10 ERA and Michael Gettys had a team-high 33 RBI and seven homers. Mikey Reynolds was amongst the league leaders for hits before missing a chunk of the season's second half through injury. Both Solbach and Reynolds have re-signed for another campaign with the Bite. Manager Chris Adamson and the Bite front office attracted suitable young talent to carry Adelaide into the future. Better yet, Whitefield and Edwards have already committed to another season in the city of churches. Whitefield joined the Bite after winning championships with the Bandits and executed for Adelaide at the top of the order. The 22-year-old hit .253/.330/.392 with four home runs, 18 RBI and nine stolen bases. Edwards featured in 38 of the Bite's 40 regular-season games, including 33 as catcher, and hit .321 with three homers. His 24 runs batted in were the most by any Aussie on Adelaide's roster. Offensive production still proved a problem for the Bite at times and compounding that was the fact Adelaide finished with the third worst ERA in the ABL. The Bite gave up 4.42 runs per nine innings, with only expansion teams Auckland (5.35) and Geelong-Korea (8.36) faring worse. Game four starter Greg Mosel battled command issues, giving up 21 walks in 30 innings to finish with a 5.70 ERA. Reliver Jared Wilson had similar troubles, issuing 20 walks 15 1/3 innings to compile an 8.80 ERA. Others struggled for consistency and with Adelaide's offence misfiring at crunch times it proved costly in the playoff race. Defeated Melbourne 7-5 at Bennett Field on November 25. Adelaide was staring at a 2-6 start to the season trailing 5-2 to Melbourne entering the bottom of the fifth. But led by three homers from Michael Gettys the Bite charged home to win 7-5 at Bennett Field in their round two finale. Gettys finished with five RBI and Mikey Reynolds also went deep and finished with three hits. Adelaide's offence was hitting .208 entering the contest but matched their season-high of nine hits and set a new benchmark for runs scored. 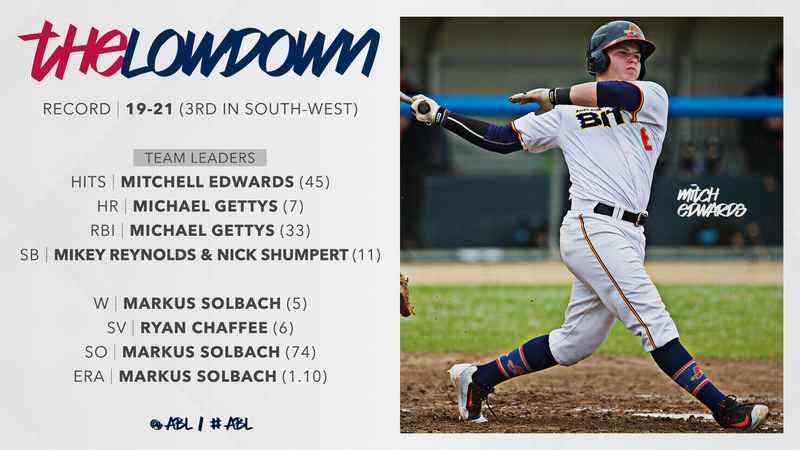 Solbach spearheaded one of the best one-two punches in the ABL, going 5-3 with a 1.10 ERA. The German finished third in the league with 74 strikeouts and allowed just eight earned runs in 65 1/3 innings. Solbach gave up more than one earned run just once, yielding four against Melbourne on January 12. Opposition hitters averaged .178 against the right-hander. Markus Solbach set a new Bite single-game strikeout record when he punched out 14 in seven shutout innings against Perth on November 29. Solbach allowed three hits and did not issue a walk as he collected a second win in three starts to begin the season. He struck out eight of the nine Heat batters he faced at least once and punched out eventual ABL RBI-leader Tristan Gray three times. Adelaide picked up an extra eight wins on a year earlier, falling a win shy of .500. They would be disappointed to miss the playoffs after coming so close and had plenty of chances in their round nine clash with Melbourne to send the race down to the final weekend of the season. A lack of pitching depth proved costly and their offence went cold at inopportune times. But the future is bright with several young stars set to return against next season.